Android TV for review, the fact that it is a 50-inch TV that costs Rs. 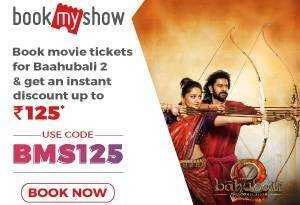 1.3 lacs and does not offer 4K support was playing on our mind. But, as you go through process, we realized how Sony’s focus with this particular model was about quality rather than the quantity of pixels on offer. Specifications: Panel: 49.5-inch VA panel with 1920 x 1080p native resolution, Panel backlight: Edge-lit LED panel with frame dimming, 3D: Yes, supports active 3D, does not ship with 3D glasses, Smart TV OS: Google Android TV, Audio Output Power: 40W, HDMI Connections: 4, Wireless connectivity: WiFi & Bluetooth, Ethernet port: Yes, USB ports: 2 USB 2.0 ports, Touch Pad remote is optional for Rs. 2,999. 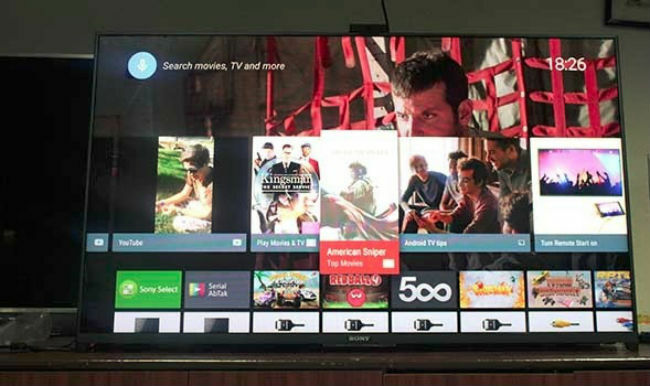 The Android TV interface on the Sony KDL-50W950C is simple, colorful and very practical in terms of how easily you can get down to finding content. As mentioned in our first impressions of this Sony Android TV, Android TV OS does bring the classic Android flavor to the big screen and makes it an easy-to-master interface for Android phone users. First up, the home screen offers all the features, apps, movies and games that you can download via the Google play store. The TV comes with 16GB of storage, out of which you sadly are only left with 8GB of usable memory to install apps. The paltry 8GB storage with no option to upgrade the storage capacity is disappointing, especially for users who plan to make full use of the vast Android TV app library and try out the games and apps that are on offer. 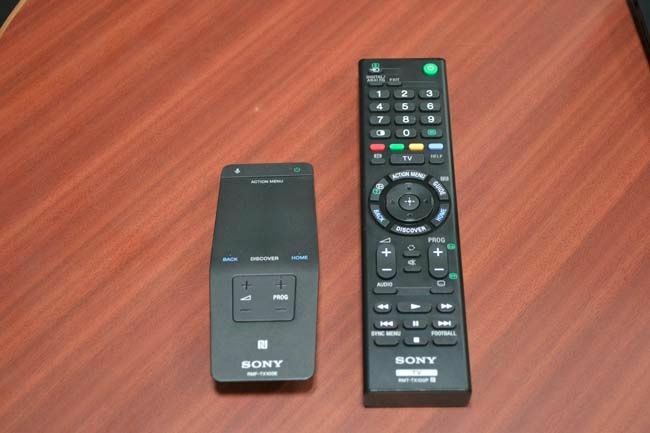 Content discovery on the Sony KDL-50W950C Android TV is pretty easy, and Sony has preloaded ‘Sony AbTak’, an app that allows users to catch up with Indian TV serials . 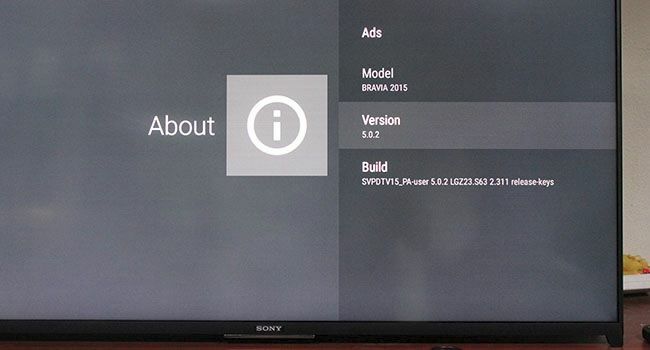 Unlike many Smart TV interfaces, the Android TV interface on the Sony TV is fast and fluid. We never faced any issues related to UI lag, app load times or random crashes. 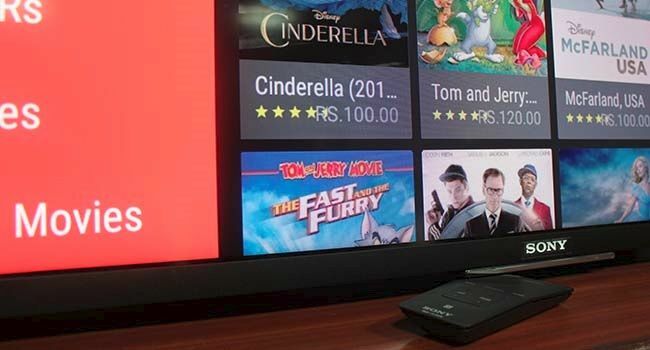 Android TV OS surely has an upper hand in terms of a solid and dependable OS for Smart TVs and it is expected to only get better. On the very first boot after internet connectivity, the OS prompted us to install an update. You can expect regular update cycles and performance improvement for TVs running on Android TV OS. 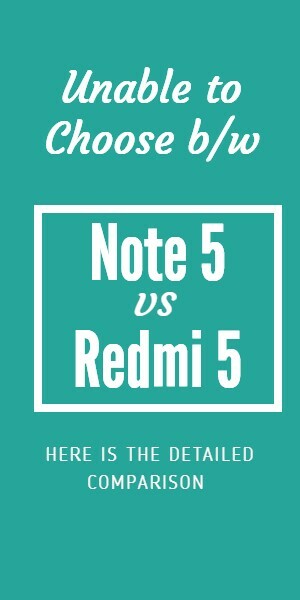 The interface is clean and offers flat Android 5.0 styled tiles and cards. Clean lines, flat and visually pleasant is the best way to describe the interface. While you can discover and browse through the curated and installed apps, the search icon that is omnipresent across almost all menus gives you quick access to the search engine that can find you specific app and content. And the search works pretty well, especially if you use the voice search option. We used (and preferred) the voice search feature to look for apps and content. The Sony TV manages to offer excellent image quality for a 1080p 50-inch panel. The blacks are deep, and manage to retain a lot of details without any signs of ugly grey streaks and blotches anywhere. Sony has used a VA panel (which is the case with most Sony TVs), and that surely helps in making the colors ‘pop’. Sony has used its Triluminos technology in the W950C series. The Triluminos display uses ‘Quantum Dots’ or semiconductor nanocrystal technology to enhance the color depth and reduce the over-saturated effect that is commonly associated (specifically) with large sized VA panel-based LED TVs. As a result, while the colors do pop and deliver the impact, we seldom found the Sony TV to be producing over-saturated colors. Contrast is another area where the TV impressed us, thanks to good black levels and a wider color gamut. Having said that, the panel isn’t the brightest around and the view angles are good but not the best. The matte finish on the panel helps a great deal in terms of avoiding reflections and that somewhat avoids the need to crank the brightness level to maximum. Being a 60Hz (native) panel, the TV handles motion well, but it isn’t in the same league as a 100Hz native panel. Hence, it isn’t ideal if you plan to do a lot of gaming or any other application that goes beyond 50-60 frames per second. The Sony Android TV supports WiFi direct, we tried a few rounds of gaming by syncing it with a smartphone. 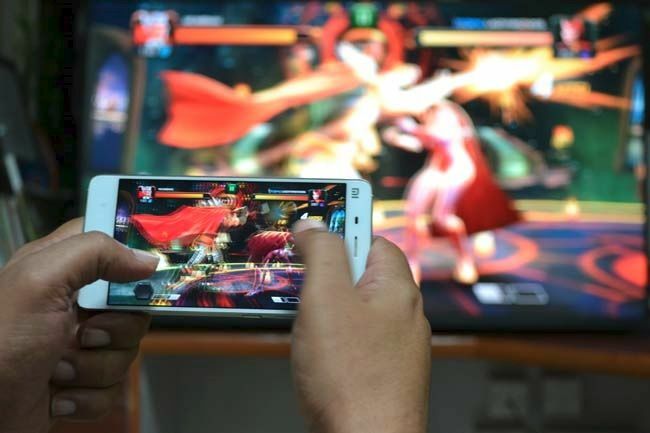 Occasional gaming is surely on the cards, though there is a hint of lag during fast paced scenes (as you can figure-out from the image above) . 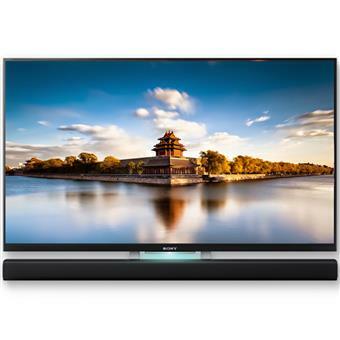 The Sony Bravia W950C Android TV offers brilliant out-of-the box sound experience. The default sound system, which consists of dual 20W two-way bottom firing speakers coupled with the supplied sound bar-like woofer, that houses two side-firing 10W + 10W bass drivers working together to deliver a wholesome aural experience. Unless you are planning to setup (and spend on) a professional grade home theatre system with this Sony Android TV, you won’t need to buy a separate sound system to go with the TV. Having said that, the sound quality, while being ‘good’ for most, isn’t audiophile grade in terms of frequency response or clarity. What’s impressive, though, is the soundstage. Sony has managed to deliver the ‘big speaker’ soundstage and impression with its built-in sound system. The Sony Bravia W950C is a far cry from most modern day televisions that are often dressed in glossy chrome and shiny surfaces. This Sony TV is all about matte finish and subtle, classic looks. The side bezel is extremely thin at 16.2mm (in thickness), and the frame is made of high quality metal with matte-grained finish. The panel itself has a matte finish and does not pose any worry or concerns over reflections. There isn’t a single hint of gloss or shine on the TV, something that we surely appreciate. The dim glow below the Sony logo at the bottom is subtle, just an indication of what mode the TV is running on (power on, standby, etc.). At the back, the panel continues its slim profile for most parts, till you arrive towards the bottom half where the panel width increases to about 5 times, that’s the area that houses all the connections, ports and the core processing engine of the TV. The supplied sound bar-styled woofer sits behind the TV when in table-top position, and can be mounted below the TV when the unit is wall-mounted. The long, button-laden default remote is a stark contrast to the excellent optional click pad-based remote. The click pad remote is a must buy for this TV . We recommend the Sony KDL-50W950C to anyone looking for a high quality (picture and sound) TV with the best Smart TV features that are on offer today. On the other hand, if you do wish to go the 4K route any time soon, the Sony KDL-50W950C will struggle to convince you in terms of its future-proof quotient, or rather, the lack of it. It was very good that I read your post.Sony TV can not talk now, I suppose. So thank you for sharing it.I hope you’ll post some more later.